Bio: Growing up on the southern California coast, much of Brenda Boylan’s time was spent sketching outdoors as she discovered her surroundings either on the shoreline, in the desert canyons, or eucalyptus groves. She was taken under the wing of her neighbor, oil painter Robert Guise, when she was 11 years old. Brenda went on to take a Bachelor of Science Applied Art & Design degree, Cal Poly State University, San Luis Obispo, 1986. Boylan began her artistic career as a graphic designer for high profile sportswear clients such as Nike, Adidas, Columbia Sportswear, and Avia. In 1994 she converted to a fine art career painting in pastel or oil, quickly earning her the distinction of Signature Memberships with the Pastel Society of America and the Northwest Pastel Society. She took a number of workshops in pastel with Kitty Wallis. Her biggest joy is painting in plein air including organized plein air events, as well as teaching pastel workshops. Her work has been displayed at The National Arts Club in New York, the Butler Institute of American Art Museum in Youngstown, Ohio, The Oregon Historical Museum, The Portland Art Museum, and the Favell Museum in Klamath Falls, Oregon. 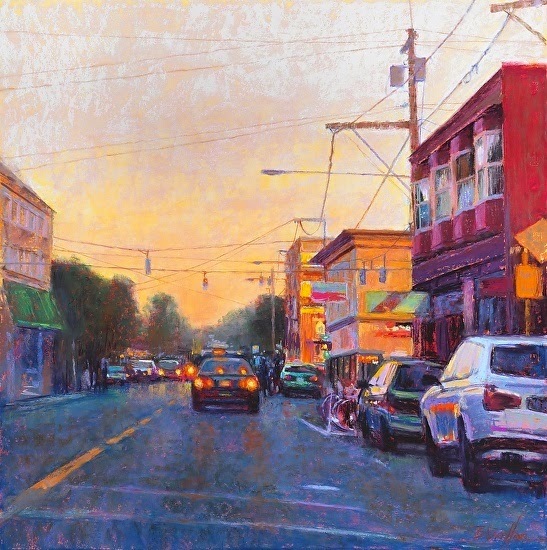 Recently, Brenda has featured in numerous publications, including the Pastel Journal, December 2014 (cover feature), Southwest Artist Magazine August 2013, Plein Air Magazine April 2012, The Best of America Pastel Series II and she was a Featured Artist at the 2nd and 3rd Annual Plein Air Conventions in Monterey, California. Boylan was the recipient of the President’s Award in the PSA’s 2014 annual exhibition. Subjects: Landscape, Figurative, Still life. Technique: For urban scenes, Boylan likes the square format, working on a 24 x 24 sheet of Wallis museum sanded paper in white. An underpainting of complementary or slightly contrasting colours underpins the many layers of pastel that follow. Gallery: Plein Air; Urban; Landscapes (Studio); Figurative; Still Life.